the Jupiter area. One of the articles in the book was based on excerpts from a scrapbook kept by Mrs. Frank Shuflin. 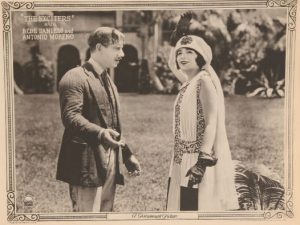 In the scrapbook she clipped an article about a “moving picture”being filmed in the Jupiter area in 1923 starring Dorothy Dalton, a major star of the silent film era. In the movie being filmed, they needed a tropical swamp for a scene. The article describes how they could not find a suitable location in West Palm Beach, so they headed up to Jupiter for filming. 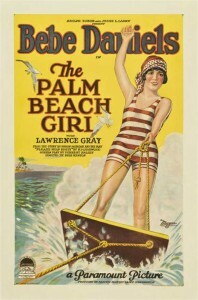 They filmed at the Pennock Plantation and the Lainhart orange grove west of Jupiter. 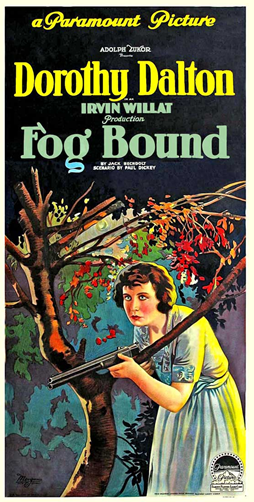 The article did not mention the title of the film, but did mention the director, Irvin Willat. inveterate thrill-seeker, chooses as her mate a handsome gangster (Antonio Moreno). Lots of thrills and laughs occur as a result of this shaky union. The gangster eventually reveals that he’s an undercover cop, and the girl finally agrees to curb her craving for excitement. 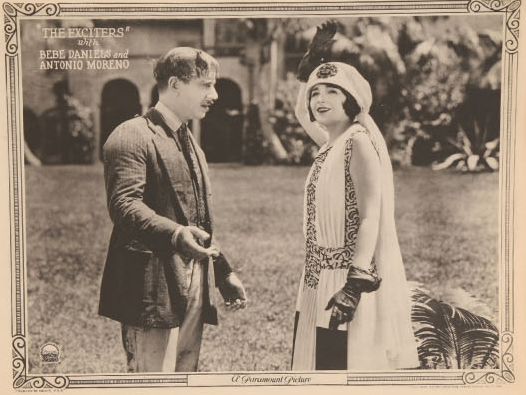 Veteran scenarists Sonya Levienand John Colton adapted The Exciters from a novel by Martin Brown.” Bebe Daniels returned in 1926 to film “The Palm Beach Girl”, where many locals served as extras at a train station scene in the movie. Another scene with a train was shot in Jupiter, where a train rammed a prop car. collection. It is estimated that 60-80% of the silent movies filmed are no longer in existence (http://www.silentera.com/lost/index.html). Films of this era were made with a type of material called cellulose nitrate, which was extremely flammable. Old black and white movie film also contained quite a bit of silver, so thousands of movies were destroyed for their silver content. This kind of film is no longer used; it was replaced by “safety film” which was still stamped on film and negatives well into the late twentieth century. The George Eastman House has a Czech copy of The Heart Raider in its collection, and it would be interesting to see the Palm Beach and West Palm Beach of 1923. I don’t know if indeed these are the oldest movies ever made here, but they certainly are among the earliest.